Happy Halloween Apple Marshmallow Treats !!!! Happy Halloween everyone! 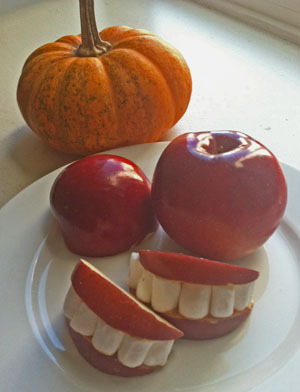 Time to take your little trick or treaters out for some yummy candy. Lots of candy, sugar, sticky and gooey treats that all kids, big and small love. But you can still make some fun and healthy treats for the big and small kids that are actually not so bad for you, and fun to make and eat. All you need is apples, peanut butter, and small marshmallows, very simple and tasty! Just slice the apples, use the peanut butter as your glue for the marshmallows and top it off with another slice of apple. That’s it! So enjoy this crazy holiday scaring each other and trick or treating, but most of all remember to be safe! Enjoy! These are so cute! My kids loved them! Thank you! They are fun for big kids too!